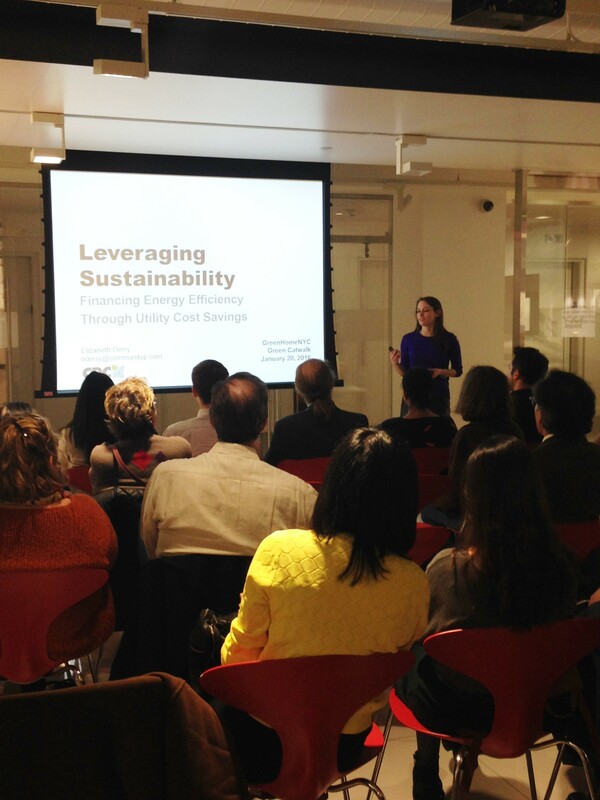 Sustainability trends are constantly evolving and at GreenHomeNYC’s annual Green Catwalk, a number of hot topics were placed center stage as seven speakers discussed issues like carbon assets, solar technology, sustainable modular housing, green financing and benchmarking. 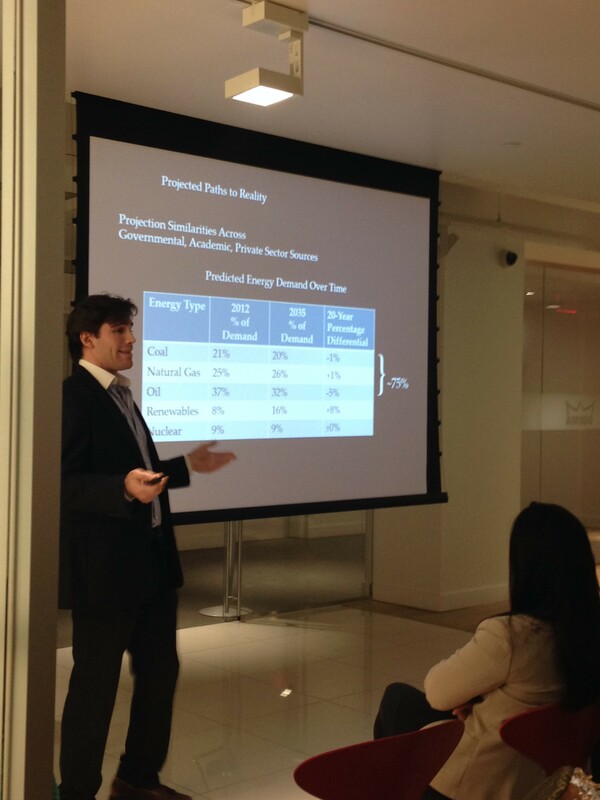 Reed Shapiro, Director of Business Development at Carbon Credit Capital, started the evening by making a case for integrating carbon offsets in the building industry. To avoid exceeding a global temperature increase of 2°C, broadly seen as the planetary tipping point for catastrophic impact from climate change, we need to look at the critical role that buildings play in greenhouse gas emissions. Buildings make up approximately 40% of the annual 5 BT U.S. greenhouse gas emissions: 15% through manufacturing, 83% through use, and the remainder through design, distribution, on-site operations, and demolition or refurbishment. Shapiro laid out three paths to building sector neutrality. One is renewable energy sources like wind, solar, geothermal and others. The second is low carbon design, including passive solar, green roofing/living structures, and heating and insulation breakthroughs. The third is the use of renewable and low-carbon building materials such as New-crete, FSC, reclaimed/repurposed materials, matured resource management and waste diversion. To avoid the 2°C warming, the building industry needs to achieve carbon neutrality by 2038-2050, or extend this window through GHG reductions in other industries. It’s unlikely there will be global industrial implementation for renewables, sustainable design and sustainable materials within the given timeline, so we must find a way to bridge the gap. Carbon offsets have the potential to transform the building industry through voluntary markets, which are independent of public policies. Financially feasible sustainability changes in building construction and maintenance offer both the opportunity for economic growth and the potential to extend the timeline before we reach the 2°C global temperature increase. Elizabeth Derry, of the Community Preservation Corporation (CPC), followed with a presentation on the CPC’s new program to finance energy efficiency projects. As a non-profit affordable housing and neighborhood revitalization lender, the CPC works throughout New York State to provide construction and permanent financing to owners of multifamily housing in low and moderate-income neighborhoods. In 2014, the CPC initiated a participatory planning process to improve programs and, in doing so, discovered a need for more conventional financing strategies, like underwriting to energy savings, which could be paired with standardized technical services and incentives when available. The result was a comprehensive initiative that included outreach to borrowers with energy intensive buildings, underwriting to monetize operating savings from a retrofit, and evaluation and technical assistance. To underwrite these energy efficiency savings, the size of the first mortgage is increased to cover the additional cost of an energy and water retrofit. This provides economic stability by reducing building expenses and enables owners to retrofit buildings without the need for incentives. In the underwriting process, projected utility cost savings, as indicated in an energy audit or green physical needs assessment (GPNA), will be incorporated into the loan’s underwriting at a 50% discount. The percentage of the savings discount may be adjusted based on metrics and risk factors. New construction and gut renovations are reviewed for energy savings potential through an energy model. Whereas the CPC is continuing to improve its process to promote the adoption of energy efficiency and water conservation during acquisition or refinancing, currently overall lender comfort with these strategies is low. Additional training and tools are needed to expand the ability to originate sustainability projects through conventional financing strategies. Tools needed include a lender guide to sustainability, an energy savings calculator and a specification handbook. 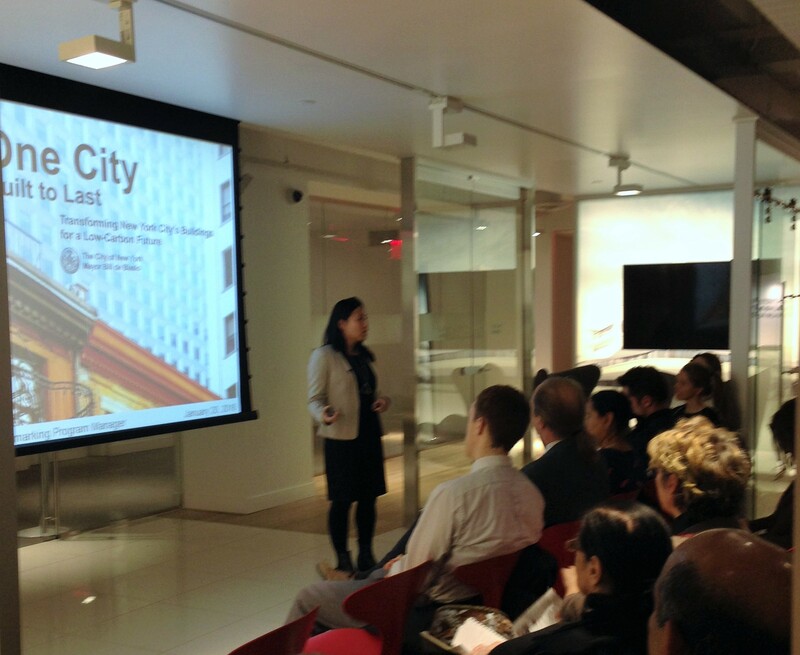 As a consultant for the City of New York, Ufei Chan is assisting in the relaunch of the NYC Benchmarking Help Center to help building owners correctly report on greenhouse gas emissions. NYC has committed to an overall 80% reduction in GHG emissions from 2005 levels by 2050. Interim targets are 40% reduction from 1990 levels by 2030 in all sectors, and 30% reduction from 2005 levels by 2025, specifically from buildings. As of 2013, NYC had reduced its GHG emissions by 19% from 2005 levels. More than 80% was achieved by improving utility operations and switching from coal and oil to natural gas. But the next set of reductions must come from improving the energy efficiency of NYC’s one million buildings. Several actions are needed for the city to meet its 2025 goals. Every city-owned building that has significant energy use must implement efficiency improvements and 100 MW of renewable power must be installed. Leading-edge performance standards must be implemented for new construction, looking to Passive House, carbon neutral, or “zero net energy” strategies to inform the standards. Finally, the worst-performing systems in existing buildings must be replaced with better systems and smarter controls. Success can be measured by energy benchmarking – the process of measuring a building’s energy use over time. This helps owners and occupants understand their buildings’ operational performance relative to similar buildings. Benchmarking has shown that large properties comprise just 2% of NYC’s buildings, but 45% of energy use (22% for heating, 11% for lighting and 12% for cooling and appliances). Benchmarking also revealed wide variations in energy use, even among similar buildings. Through benchmarking, building owners get a baseline understanding of their building’s energy use and metrics to rank the building against others in their portfolio, enabling energy efficient investments. It offers better understanding of building energy performance compared to competitors and provides a basis for an improved energy management plan. For high performers, it provides evidence of the building’s added value. With the relaunch of the Benchmarking Help Center, building owners can get assistance in reporting their energy and water data for compliance with Local Law 84. This will facilitate the submission process and improve the quality of the data. An innovative modular supportive housing project in the South Bronx was the topic of the next presentation by Lauren Hildebrand from Steven Winter Associates. Modular buildings must follow building codes both off-site and on-site, in contrast to manufactured housing. The steel-framed modules for this project were built on a warehouse assembly line over the course of two years. 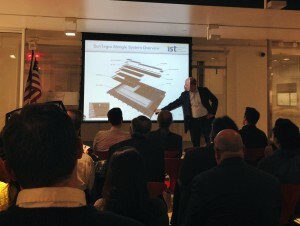 They were then transported from the Brooklyn Navy Yard for final assembly on-site, where they were stacked and connected on a concrete foundation. Sixty-three 400 sq. ft. studios now house low-income and formerly homeless individuals, including 38 veterans. The building achieved Energy Star Multifamily High Rise certification and LEED Gold for Homes: Multifamily Mid-rise. Hildebrand said the benefits of modular construction include reduced construction waste, improved efficiency, true compartmentalization allowing all six sides of each unit to be air sealed, and better quality control at the construction site. But the project was not without challenges. It required coordination of two construction teams working simultaneously at separate locations – one at the warehouse and one on-site. For LEED and Energy Star certification, open wall inspections had to be conducted at the warehouse and again on-site, once the modules were stacked. And since it was a multifamily unit, many connections, like plumbing, could not be made until the units were assembled. Despite the challenges, Hildebrand maintained that the project was a good experience overall, and hopes to see more modular construction in the future. For buildings that cannot support solar panels on their roofs, shared solar provides an interesting opportunity. Lucie Dupas, Senior Engineer at EnterSolar, described how net metering can facilitate shared solar. 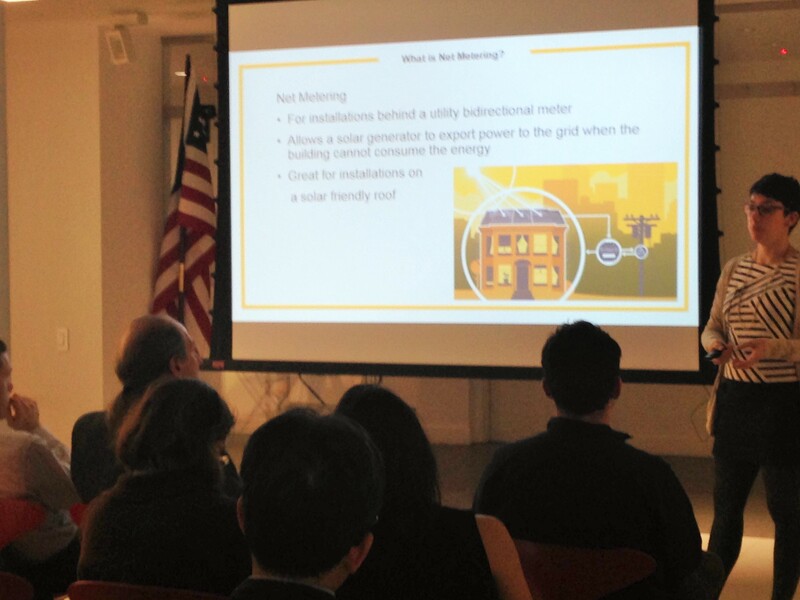 Net metering allows a solar generator to export power to the grid when the building is not consuming energy. It also allows the grid to be used as a battery, eliminating the need for batteries on rooftop solar installations. Remote net metering is a cost-effective alternative for sites with poor solar characteristics, but significant onsite energy consumption. Transferring energy credits through remote net metering allows these buildings to benefit from solar systems installed on alternative sites. To work, both sites must have the same utility, must be in the same NYISO zone and can have only one off-taker per solar interconnection. As an example, Dupas cited a Queens warehouse that is offsetting building energy use in Manhattan. Whereas remote net metering provides a good model for a single large user to transfer solar energy credits, community solar gives small energy users, like apartments, the opportunity to invest in and benefit from solar. Under community solar, one meter could have thousands of off-takers. Utilities started accepting applications in October 2015. Community solar provides the benefit of cost effective, large scale solar installations. It offsets the high cost of residential energy bills and can be financed in various ways without a 20 year commitment. Improvements to existing technologies are welcome additions that move sustainability forward. Oliver Koehler, of IST/Suntegra Solar, introduced new solar roof shingles that can be integrated directly into the roof, improving the look of a solar installation. The new Suntegra products include shingles that integrate with asphalt shingle roofing, and tiles that integrate with flat concrete roof tiles. Two unique features of their products are the integrated wiring which allows simple and safe connections, and Tegravent technology, which provides a lower operating temperature and better energy performance. Koehler mentioned some potential uses in New York, a city where tiles and shingles are not prevalent and roofs are small. The blank sides of buildings present opportunities for horizontal louvers, vertical fins or solar siding. Solar sides could provide secondary heat load reduction in spring, summer and fall. 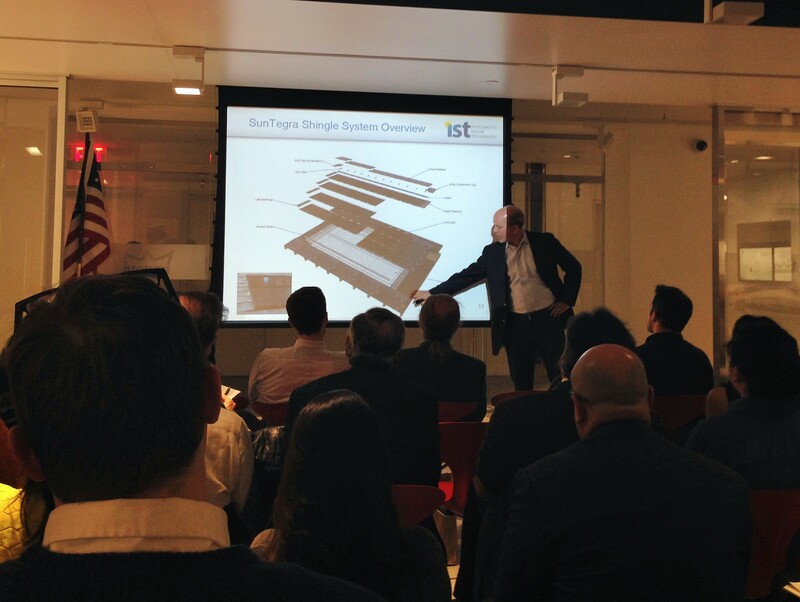 The evening concluded with Andy Padian, a self-described energy and building geek with more than 35 years of experience in the industry. 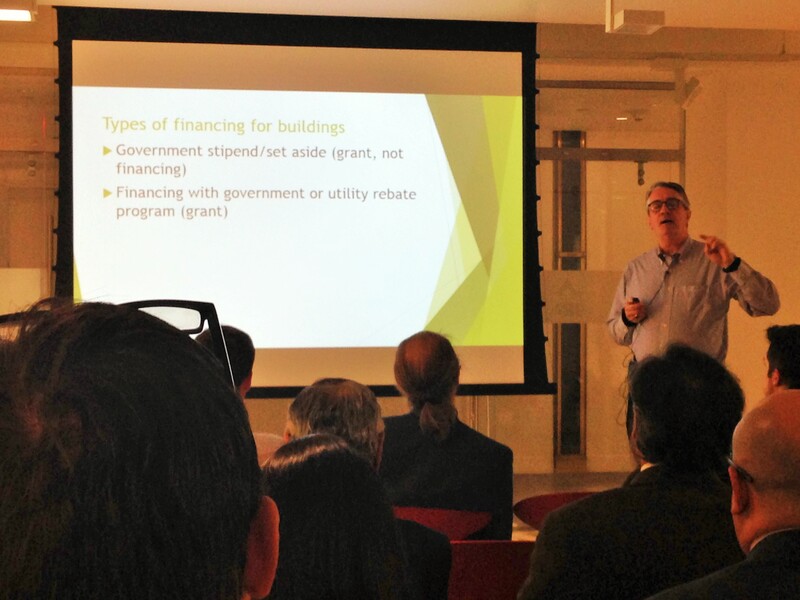 Padian discussed an energy efficiency financing seminar he attended recently in Anchorage, Alaska. 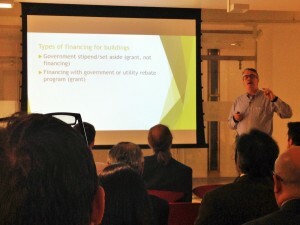 Types of financing for buildings include government stipends/set aside, grants from government or utility rebate programs, bank financing for building owners, financing with an ESCO or cash from your pocket. In Alaska, the 744 public buildings that have been audited and benchmarked have tremendous variability in energy use intensity, ranging from 33,102 BTU/SF to 1,973,345 BTU/SF, according to a 2014 state report. Water plants and washeterias were the biggest energy consumers. Further, space heating comprises 72% of Alaskan energy consumption, but there’s a tremendous loss of space heat through ventilation and air leakage –as much as 51% t spend approximately $1 billion on a new substation and transmission lines in the area. As always, the Green Catwalk provided food for thought and an overview of the next wave of sustainability trends.